Microsoft has now officially announced the Surface -- more specifically the Microsoft Surface for Windows RT and the Microsoft Surface for Windows 8 Pro. The difference in branding between Apple's disyllabic iPad and Microsoft's mouthful of a brand highlights the almost diametrically opposed philosophies behind the two approaches as well. iPad is singular and mobile native. 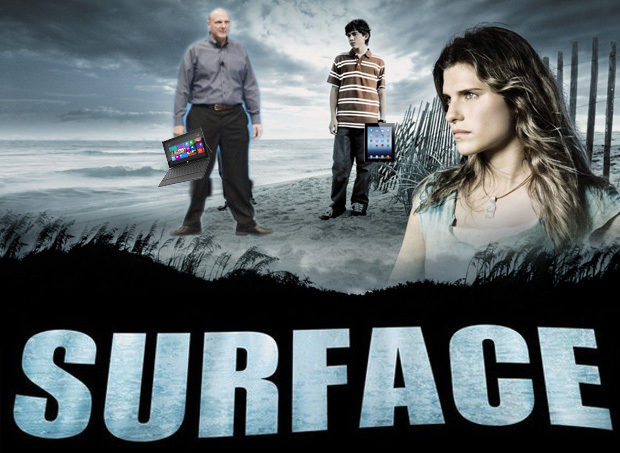 Surface is bifurcated and seeks to bridge the divide between mobile immigrant and native. iPad is the epitome of Steve Jobs' obsession to simplify and democratize computing, desperate to dent the universe and drag the mainstream into the future. Surface is the epitome of Steve Ballmer's obsession with Windows, a Microsoft wounded and waylaid by anti-trust desperate to maintain some of their desktop relevance in the age of internet and interconnected devices. Apple mainstreamed the command-line interface with the Apple II, but Microsoft was right there with DOS. Apple mainstreamed the graphical interface but Microsoft stole the show with Windows and Office. Apple revolutionized digital music and the MP3 player with iTunes and the iPod, and Microsoft crashed and burned with Windows Media and PlaysForSure, tried again with the inspired but insufficient Zune, and crashed again. Apple ignored the home console while Nintendo and Sony made fortunes in the living room, but Microsoft pushed ahead with Xbox, leapt forward with Xbox 360, and willed their way past red-rings and incumbents and into the huge success. (Apple later tested the waters with Apple TV and AirPlay.) Apple ignored the search engine while Google indexed and monetized us down to our last datum, but Microsoft broke open the bank to get into that game, and remains at the edge of the field with Bing. Apple revolutionized the smartphone with iPhone, and Microsoft ignored it to Windows Mobile's detriment, and now struggles still with the adorable but ill-adored Windows Phone. And Apple once again democratized and mainstreamed computing even further with the iPad, after Microsoft failed for a decade with Tablet PC, and then failed to respond for years more. A fighter who doesn't lose is unbeatable. Until he does. Ask Tyson. Ask Fedor. Ask Apple in the 1990s. Winning and losing are habitual. Momentum matters. To lose repeatedly, even when you won everything in the past -- especially when you won everything in the past -- hurts the soul. And comebacks are hard. Re-invention is tough for businesses. Even in the rapidly moving technology space. Especially in the rapidly moving technology space. Microsoft bet big on Windows, and with muscle and resolve they won what was up until now the biggest prize in technological history. But they lost badly on the internet. They've been bloodied in media, though the fight is far from over. And their mobile strategy has seen them ground-and-pounded through a mess of partnerships, Kins, and new partnerships. Now they have Surface. And now they have to win. That's not hyperbole. Sure, technically they have a huge legacy install base and plenty of money, but so did IBM in their time. And the company before IBM, whose name I no longer remember. This isn't simply a fight for install base or money. It's not a fight for the future. It's a fight to be the future. A fight to matter. Apple currently enjoys the type of success normally only attained by oligopolies in control of limited fossil fuel resources. Google has replaced Microsoft as the giant of the tech industry under whose feet other companies fear to stumble. Facebook may be the social network, or just the latest in a series of them, but their mindshare is growing as fast as their user base did. And Amazon is coming, especially once they make a serious international play. There's no better sign of just how critical mobile is to Microsoft and Steve Ballmer than their willingness to make their own hardware. Mice and keyboard slides aside, Microsoft is a platform company. Their preference is to make powerful, hugely profitable software for a variety of commodity hardware partners. They only made the Xbox and Zune because the content market couldn't be won by partnerships alone. Tablet PC was abysmal. Windows 7 was a traditional desktop operating system, bound to hot, power-hungry Intel chips, with "finger friendliness" bolted on. Windows Phone was refreshing, and "authentically digital" but artificially constrained to tiny screens. Microsoft's partners have been waiting for something competitive with the iPad. Enterprise hasn't even waited -- they've bought iPads. All of that is on Microsoft and Steve Ballmer. Even though Apple telegraphed the iPad over 5 years ago with the advent of the iPhone, they didn't take either seriously. But their customers certainly did. To embrace and extend Steve Jobs' metaphor, Microsoft is about to become just another truck company in a car-centric world, and they know it. Windows 8, and to a large extent, the Surface, is their play to stay relevant. To be the cross-over. The minivan. The SUV. And it's a daring play. Consumers have thus far overwhelmingly voted on the iPad. With their wallets. They haven't wanted anything more complex. They've actively avoided it. HP failed. RIM failed. Google is failing in tablets. To the tens of millions of consumers for whom traditional computers have always been intimidating and inaccessible, the iPad has been just the focus and simplicity they've been looking for. Enterprises, meanwhile, have gone BYOD (bring your own device), testing and deploying iPads faster than just about any technology in history. Usability finally found a way to beat checkboxes on the IT buy list, and there's no going back. And yet Microsoft is hoping they can get consumers and enterprise to make a different compromise. No one, not Microsoft, not Apple, not Google can be all things to all users with all software on all devices. Every choice has a cost. Every decision is a compromise. And mobile is an extremely harsh environment. Microsoft is hoping users will compromise on the focus and simplicity of the iPhone for the flexibility and functionality of Windows 8 and Surface, and that's anything but a sure bet. In fact, the Windows 8 mobile strategy is Microsoft's and Steve Ballmer's biggest gamble ever. If they lose, Ballmer may not be at the helm much longer, and Microsoft might have to console themselves to fortune absent relevance. There's no better sign of that than Microsoft's rush to show the Surface off in between Apple's WWDC 2012 and Google I/O 2012, before they even had pricing or availability, before they even offered screen resolution for their Pro model, or battery life for either. Before they could even take pre-orders. Before their partners could start marketing their hardware. And to be clear, until Surface ships it's not an iPad competitor, an ultrabook competitor, or even a PlayBook competitor. It's a promo video. Once that'We can quibble about what will define a win here for Microsoft -- what metrics and markets will be used as the measure. But that win has to be there. It's getting towards the last round, and they're all out of rope-a-dope. There'll always be a place for not-Apple. We need not-Apple. And Microsoft can always keep trying with Windows 9 and beyond. But if Surface and Windows 8 fail, it might not matter anymore. Not for Microsoft.